State Of California - Department Of Transportation Alternative Fuel Vehicle Only Parking Signs - 12x18 - Reflective Rust-Free Heavy Gauge Aluminum Parking Signs with Anti-weather and Anti-graffiti Protection Available. 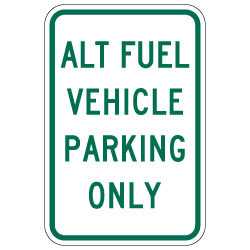 This State of California - Department of Transportation Alternative Vehicle Parking Sign meets the California Standard Sign Specifications for R116 Alternative Fuel Vehicle Parking Only Signs. Hybrid and Electric Vehicle Parking and charging stations are becoming increasingly popular in cities throughout the United States. In fact, nearly 8,000 charging stations now exist around the country today, of which half have been built since 2012. Despite the recent dip in gas prices, the demand for alternative-fuel vehicles continues to grow in popularity. More so than ever before, consumers have become ecologically aware of there environment wanting clean-air alternatives to gas-powered cars. With State and federal regulations being made tougher, automakers are required to manufacture cars that meet stricter emissions standards and higher gas-mileage rules. Despite the expected increase in demand, not all sign companies currently provide signage for hybrid or electric vehicles. Fortunately, our company offers a varied assortment of alternative parking signs for our customers to choose from based on their preferences.